On March 21, Apple released a brand new phone — iPhone SE, announcing it as the most powerful 4-inch phone ever. And according to tradition, it is highly possible that Apple will introduce another two flagship iPhones which are iPhone 7 and iPhone 7 Plus in this fall. Apparently, a great amount of people are willing to buy one. Whether you prefer to get an iPhone SE or iPhone 7, one thing for sure is that the larger its storage space is, the more you need to pay. If your budget is limited, a good solution is to buy an iPhone with a small phone memory and to back up important files and clear the internal memory from time to time. Here, I’d like to provide you three options you can choose to backup iPhone 7 easily. 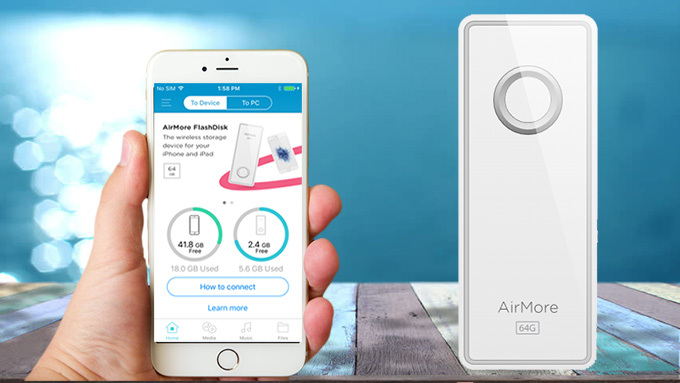 AirMore FlashDisk is a wireless storage device for iPhone and iPad. You can use it to store all the files as you like, including music, photos, videos, documents, etc. In this way, you are able to add storage to iPhone or iPad in a large scale. This hard disk is very small and light, so it is very convenient to bring it along. Besides, it allows you to share the files with others in real time. To backup iPhone 7 data to it, please follow the steps below. Download AirMore+ app on your iPhone. Turn on AirMore FlashDisk. Connect iPhone to the WiFi it produced, which begins with “AirMore”. 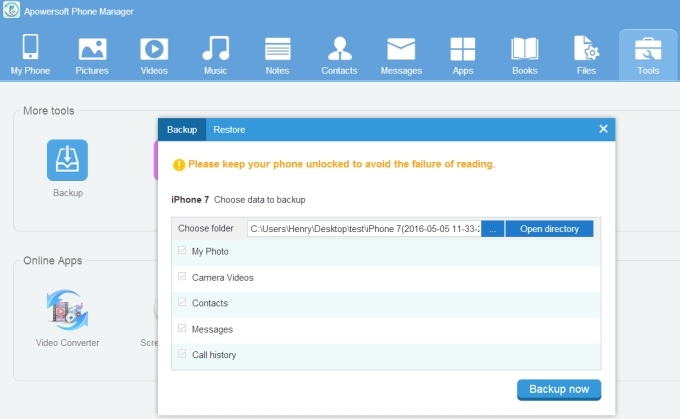 Open the app, and tap Media, Music or Files to find the data you need to back up. Tap “Select” on the right upper corner and choose the files. Then tap “Operate” to copy or cut them to the flash disk. Within a short time, the data will be transferred. Afterwards, disconnect it. It is a tiny and light device, so you can take it anywhere you go. Extremely convenient! It can be used without USB cable or public WiFi. Very practical! The files saved in this FlashDisk are stored locally. Highly secure! If you prefer to put the files to your personal computer, then this desktop program is what you are looking for. Apowersoft Phone Manager is a professional management application for mobile phones, iPad and tablets. Its clean and simple interface makes it easy to understand how it works. Without further ado, you may read the instruction here to backup iPhone 7 to PC. Download the software on your computer. Make sure you have installed iTunes. Run the program. Connect iPhone to it with the provided USB cable. Tap “Trust” if a window pops up. After successful connection, you can go to the corresponding tabs and export the files to PC. Another simple way is to click “Tools” tab and choose “Backup”. This feature enables you to backup important data to the computer with one lick, including photos, videos, contacts, messages, call history and more. The operation is super easy. It offers multiple ways to backup files. Most Apple users have heard of iCloud, but not everyone knows what it is for or how to use it. Actually, iCloud provides you a place where you can store your photos, videos, documents and more. Once you saved the files into it, you can get access to them from any device after you sign in the same Apple ID. Though the wireless storage space is limited, it’s still a nice way to backup iPhone SE or 7. In case you don’t know how to do it, here’s a guide you may refer to. On your iPhone, go to “Settings”. Find “iCloud” and tap it. Enter your Apple ID and password, and agree the terms and conditions. After that, tap “Backup” and turn on “iCloud Backup”. 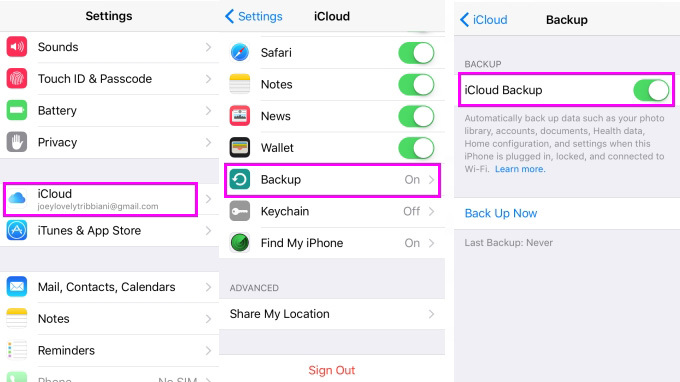 Then you can choose “Back Up Now” to sync data to iCloud. iCloud is a default app in every iPhone, so you don’t need to download a third-party app in order to use it. 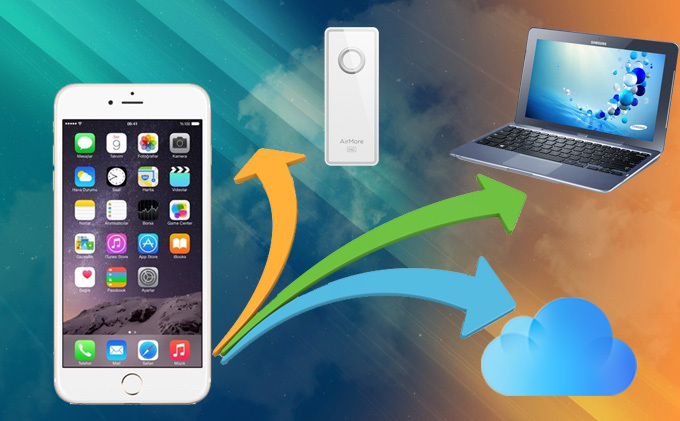 Easy access to the backup files from PC and any iOS device. All the above methods can meet your demand of backing up iPhone 7 without hassle. Which one is the best? It totally depends on your needs and conditions. However, AirMore FlashDisk is supposed to be the most practical way, as it is simple to use, easy to take and safe for storage.